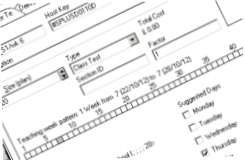 Search by departments, location, module or programme of study for up-to-date information held in Enterprise Timetabler. 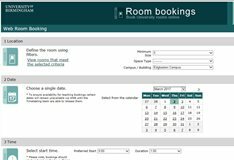 For all non-teaching booking requests use Web Room Booking. Information including term dates, the teaching weeks and the Block timetable. Contact details for the Timetabling team (Staff only - login required). 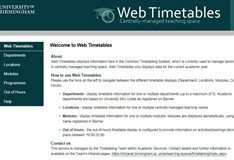 The Timetabling team manage the scheduling of teaching throughout the academic year, the production of online timetables for students and staff and administer the Web Room Booking service for non-teaching bookings.